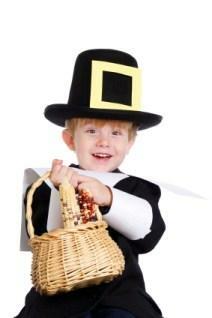 Reading books about giving thanks is a great way to get kids excited about the upcoming holiday. Books about Thanksgiving, like other books, can have a myriad of themes. Some books are historical fiction, giving children a glance at what the original celebration was like, while others provide counting or alphabet fun. Others offer great ways to teach children about appreciation and giving, and others are silly stories about the holiday. The Very First Thanksgiving Day by Rhonda Gowler Greene: This book is a rhyming journey about the first day of the first Thanksgiving feast, perfect for preschool aged children. The Story of Thanksgiving by Nancy J. Skarmeas: With short, easy sentences, this book touches on the Pilgrims' search for religious freedom and is a great read-aloud for beginning readers. An Old-Fashioned Thanksgiving by Louisa May Alcott: The 40 pages of this book by the well-known author is a good read for older elementary students, and it offers a glimpse into early Thanksgiving celebrations in the United States. Thanksgiving Mice! by Bethany Roberts: Kids will be delighted by the idea of mice celebrating a historical feast. Thanksgiving Is. . . by Gail Gibbons: Each new page uses the line "Thanksgiving is" in order to tell the story. Thanksgiving Is for Giving Thanks by Margaret Sutherland: Written for toddlers and preschoolers, this book zeroes in on the idea of gratitude during the season. The Thanksgiving Story by Alice Dalgliesh: This book about the first Thanksgiving won a Caldecott Honor award for illustrations by Helen Sewell. The Thanksgiving Door by Debby Atwell: Children learn what the Thanksgiving spirit really is about when they read about the hospitality of a family who invites strangers to celebrate with them.
. . . If You Sailed on the Mayflower in 1620 by Ann McGovern: Although this book does not discuss the actual holiday celebration, it does give information on how the Pilgrims came to America and their hardships during the trip and afterwards. It is a good supplement to other Thanksgiving stories for children. Squanto's Journey: The Story of the First Thanksgiving by Joseph Bruchac provides the Native American's perspective. This book describes the viewpoint of Squanto, who was captured and sold as a slave in Spain before returning to help the pilgrims and the Native Americans work together. P is for Pilgrim: A Thanksgiving Alphabet by Carol Crane offers up short rhymes using the letter at hand, with sidebars explaining concepts. This First Thanksgiving Day: A Counting Story by Laura Krauss Melmed offers up a story about the holiday that features a counting theme. In addition to the books that have an emphasis on education and historical fiction, many favorite children's storybook characters have books that feature the festive holiday as the main focus. These books often focus on sharing and giving, though they may offer a few historical tidbits, too. Dora's Thanksgiving, Arthur's Thanksgiving and Happy Thanksgiving, Biscuit! are just a few children's books with favorite characters.